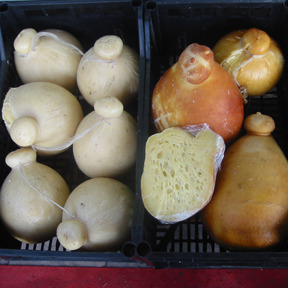 When I was shopping in the market on Friday, I bought a chunk of flavorful, slightly aged provolone at the stall that also sells fresh mozzarella, ricotta, cannoli, ricotta salata and other cheeses that I look forward to being introduced to. Gaetano, the man behind the counter with a scruffy beard and fairly good English, saw me looking at the cauldrons in the small, utilitarian workroom behind the counter. He explained that most mornings, he and his father Andrea Borderi, the man with the blue silk tie, the sunny smile and the big knife, made ricotta and mozzarella. I hesitated for less than a minute before I asked if I could watch the next time they made cheese. He frowned, shook his head and said “No,” and then with a smile he said, “Ma (but), you can come and work if you come at seven on lunedi.” I said yes, of course, I would come. A quick check in the Italian/English dictionary confirmed that I had a date for Monday morning at seven. I started the day by watching the sunrise over the sea. The colors would have inspired Maxfield Parish. Then, Charles and I had to hurry across the empty Piazza Duomo to the cheese shop. We were greeted with smiles, and with a sweep of his arm, Andre invited us into his kitchen. He quickly looped an apron over my head and tied it around my waist. Charles stepped back from the action, camera poised so as not to miss a shot. I washed my hands and was ready to work. 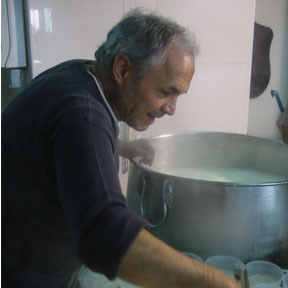 My first task was to help with the caldron of ricotta. 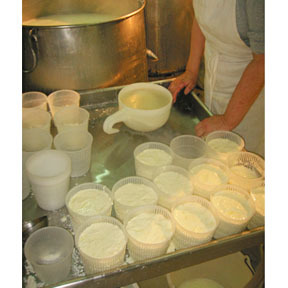 We used ladles to skim the warm curds into slotted, one liter, plastic containers that were then put on trays. When full, the trays were put into the refrigerator. 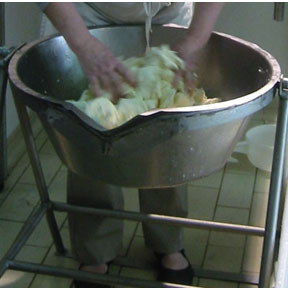 When ricotta is sold, the slotted container is put into a double plastic bag and the whey continues to drain from the curd making it thicker each day until it has all been eaten. 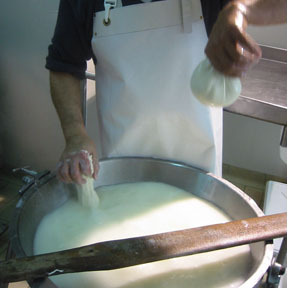 The curds for the mozzarella had been started before we arrived. Whole milk and rennet had been mixed in a huge stainless steel pot and then heated slowly until it reached 32 degrees centigrade or 88 degrees Fahrenheit. It took about 15 minutes for the curd to form. 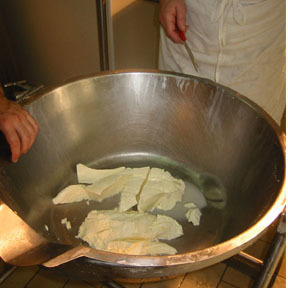 The curd was in a bucket, a dense mass covered with whey. It was large as a watermelon with texture similar to raw liver. Andrea handed me a knife with a blade that was at least two feet long. To cut the curd, I held the knife with its blunt tip resting on bottom of the pail and pulled the blade through the curd again and again. When it had been to cut it into irregular pieces that were about the size of walnuts, it was drained and put into a large basin. Andrea asked me to knead ottocento (800) grams of sea salt into it. When he decided that it had been sufficiently kneaded, the curds were rinsed with water until his taste test determined that enough salt had been washed away. The next step involved stretching and shaping. The curd was covered with very, hot water and I was given a three-foot long wooden tool. I mistakenly thought that what looked like the handle was a handle. 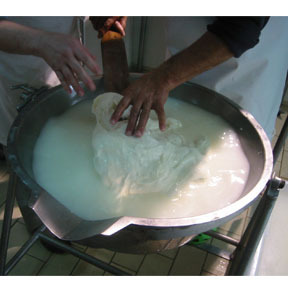 After Andrea turned it around, he placed my hands on it, put is hands over mine and together we stretched and squeeze the curd until “Ecco!” The curd had become stringy, tender, fresh mozzarella. 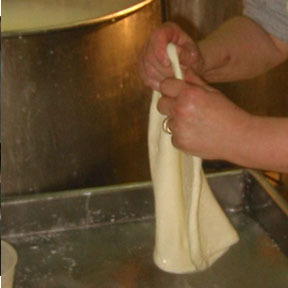 With amazing speed and skill Andrea stretched, cut and braided cheese to form ten braided loaves called treccia. It would be smoked later that morning and offered for sale as affumicata the following day. Then he pulled a coconut-sized piece of cheese from the mass still in the basin and indicated that I should flatten it into a disc as thin as I could manage. My memory of Lucy and Ethel trying to twirl pizza dough in the air provided the restraint that kept me from trying to do the same thing with this piece of cheese. I patted, poked and pulled it until Andrea indicated with a quick nod that it was a good size. I followed him and the cheese to the large cutting board where he handed me two tomatoes, a handful of mixed olives, a few sprigs of flat-leaf parsley and a knife longer than my arm. 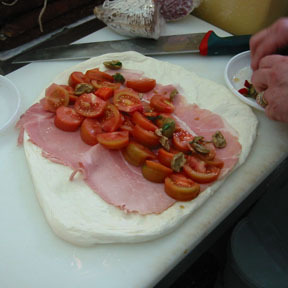 He covered the cheese disc with two thin slices of ham, used signs and smiles to indicate that I should cut the tomatoes, seed and chop the olives, chop the parsley and put it all on top of the ham. When I had finished, he splashed it with olive oil, and it took four hands, his and mine, to lift the cheese and its toppings onto a large piece of foil. The last step was for me to tightly roll the cheese into a cylinder with the ham and vegetables inside. That done, he put the cheese roll in a bag and gave it to me. I shared it and the story of its creation with two new friends who came to our first dinner party in Sicily. 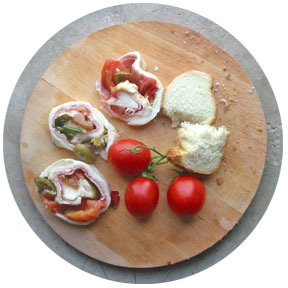 If you would like to recreate the tastes without the travel you could make a mozzarella torte by layering the freshest mozzarella you can find, with the tastiest bits of vegetable and/or cured meat you can imagine, in a straight-sided bowl. Covered, weighed down and chilled it will be perfect served with a smile and a toast to Andrea, THE premier cheese artisan of Siracusa. I’m so happy to have found your blog by way of your comment. What a fantastic experience you had. I hope Andrea’s mozzarella hasn’t ruined you for all future mozzarellas. Thanks for finding me! It is a terrific place and I hope to be there next winter. 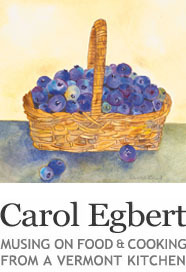 Dear Carol – What a lovely article about cheese and the artisans behind the making! You have a lovely corner here & I so kind of you to stop over for a visit in mine. Thanks for stopping by and leaving such kind words. Andrea is one of the kindest, sweetest people in the entire world. I hope you make a version in your kitchen. Thank you very much for your visit and very good post! Thank you for visiting and leaving a comment. I hope you have a chance to shop in this market. How fun to take part in this! Oh I am now craving this mozzarella torte! How lovely to see my friend Andrea Borderi featured here, great cheesemaker, charming man, lovely family. I have taken cooking class guests to him since the time when he was still making cheese in his home and selling from a van. I am so delighted he now has his shop and workshop in the market. His cheeses are special: Andrea’s skill and experience combine with his charm and passion and transfer to the food he creates. Andrea and his family are terrific people. His face lights up the market and he is unable to stop feeding people. What a day in the perfect setting! What a wonderful experience that must have been for you! Also an amazing lunch. I’m very very jealous . I love it, i always want to get my hands dirty with the artisan’s. So envious. I bet your hands tasted good after all that cheese kneeding.